Mentors have a crucial asset new business owners lack — experience. Every year in the United States, an average of 587,000 new small businesses are born. The bad news is only half survive five years. And by the time you get to 10 years, that number is cut to one-third. But, there are ways to increase your odds of survival. Working with a mentor has proven to be an indicator of success. Here are five reasons why. 1. Mentors put statistics back on your side. The survival rate of new businesses is understandably intimidating to entrepreneurs, but those numbers can change drastically when you add a mentor to the equation. According to a survey by The UPS Store, 70 percent of mentored businesses survive more than five years. That's double the rate of businesses who choose not to have a mentor. New small business owners often lack one fundamental thing — experience. It takes years upon years, and sometimes lots of money, to gain the business experience to run a successful company. Mentors give you the opportunity to draw on that experience right away — and for free. Running or starting a business will never play out precisely as you planned. When you hit a roadblock, small or large, mentors with business experience likely have come across something similar before and know strategies to move forward. Harvard Business Review surveyed 45 CEOs with formal mentor relationships, and 84 percent said as a result, they have avoided costly mistakes and became proficient in their roles faster. In the same study, 69 percent said mentors helped them make better decisions, and 71 percent were certain company performance improved. 2. A mentor’s support and motivation can be invaluable. It can be lonely at the top. Starting a small or medium-sized business means you don’t have a boss above you that supplies employee motivation and engagement programs, which can be vital for worker happiness and success. A mentor can often fill this void, acting as a coach to provide support, motivation, validation and encouragement. 3. SMB mentors offer accountability for entrepreneurs. 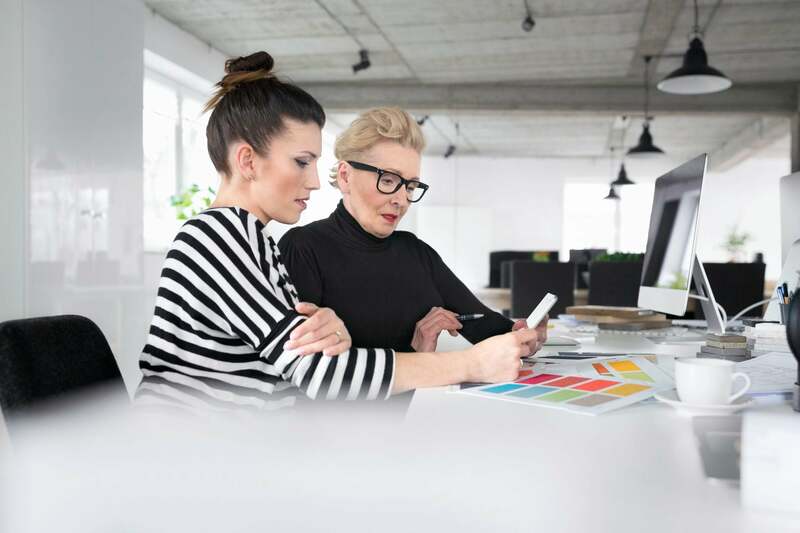 A good small business mentor can help define critical tasks and guide your business goals — and more importantly, help the company hold itself accountable for meeting them. Not only does accountability help companies meet these goals toward success, it fosters a culture of self-reliance and self-confidence. This is where mentorship becomes a two-way street. Maintaining consistent meetings with your mentor is the only way to ensure accountability. You must put in the effort to make the relationship work. 4. Working with a mentor widens your network. Potential clients, employees and other sources of advice — all these types of people, and more, can be unlocked when you have a business mentor. A mentor brings their own network of invaluable people, and those contacts could be at your disposal. Have a specific business problem? A mentor may know the right person to turn to for help. Looking for the perfect person for a new role in the company? They could also recommend a contact from their experience in the industry. Having a stacked contact list is crucial for your business in the long run. 5. Where to find a mentor. There are several places you can look for a mentor. SCORE: Partnering with the U.S. Small Business Association, SCORE is a nonprofit that helps connect small businesses with volunteer mentors of both active and retired executives and entrepreneurs across 62 industries. There are 300 chapters across the country, so you can connect with a local mentor to meet in person, or you can set up video or email relationships. Local networking events: These events are designed to connect you to other business professionals. Look for conferences or networking events for both your specific industry and small businesses in general, and try to speak to as many people as you can. SBDCs: Small Business Development Centers provide assistance to entrepreneurs and small businesses by way of training sessions and free business consulting. Host networks for SBDCs are located all across the U.S. and its territories. Search for a location near you by using a tool on SBA.gov. Women’s Business Centers: The Association of Women’s Business Centers sustains a network of 100 business centers across the United States, each of which supports female entrepreneurs with mentoring, as well as training, business development and finance opportunities. The AWBC also runs conferences, which can be great places to connect with potential mentors. Find a WBC near you. Veterans Business Outreach Center: VBOCs provide many entrepreneurial development services, including mentorship, to veterans, transitioning service members, National Guard & Reserve members and military spouses who are starting or growing a small business. You can search for locations near you on the SBA.gov website. MBDA Business Centers: As an agency with the Department of Congress, the Minority Business Development Agency works to promote the growth of minority-owned businesses, in part through business centers located across the country in areas with the highest concentration of minority populations and minority business owners. Professional and trade associations: For a price, you can join a professional or trade association in your industry. Those dues go toward investments in many things, including education and networking — usually with experienced business leaders in your industry. Social media: Don’t neglect your own personal network when it comes to finding a mentor. LinkedIn and Twitter can be great resources for connecting with other professionals and potential mentors. No matter where you turn to find a mentor, connecting with the right one should be a key step in your business plan. The right mentor can guide you through tough business choices and help set you up for success for years to come.